#1 City living. The need for an affordable house pushed me into a city I had originally intended to avoid, if only because of resale issues. But I’m glad it did, because I really like it here. People often think of this city as dangerous and poverty-stricken. It does have some downtrodden neighborhoods, but it’s also beautiful and interesting and lively. In my little subdivision, built in the 40’s, we each have a little lot and a little house – and it’s plenty enough to live in comfortably. I don’t feel unsafe. I don’t have to worry about bears, either. And I’m close to everything. #2 My space. Even though it’s a much smaller house (less than half the size of the old one), I feel as if I have more space. This isn’t so much because of downsizing as the reason for downsizing — my ex has retired to his beloved Puerto Rico (and we are legally separated). My son has his own TV in his own room now (he’s nineteen, so I don’t feel guilty about that). That means I actually have a living room that I can use as I wish — for reading, or for watching what I want to watch. It’s strange and quite pleasant, after nearly 24 years of marriage in which the remote largely sat in the hands of someone else and togetherness meant watching vast amounts of TV. Also, while sharing the single bathroom with my son does require some adjustment, at least now I can insist that he lower the seat. His future wife should thank me. #4 No tense interior design negotiations. I can hang the pictures I want wherever I want them. And then I can take them down and hang them somewhere else. (Yep, there’s been quite a lot of that.) Since my walls are papered-over paneling and due for painting before too long, I don’t even feel guilty knocking all those holes into them. 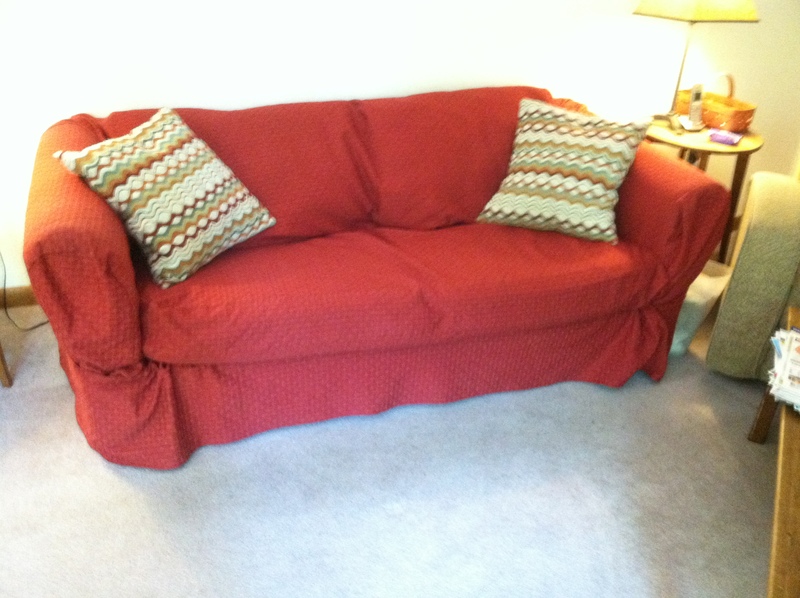 I’ve also been rearranging furniture to my heart’s content. 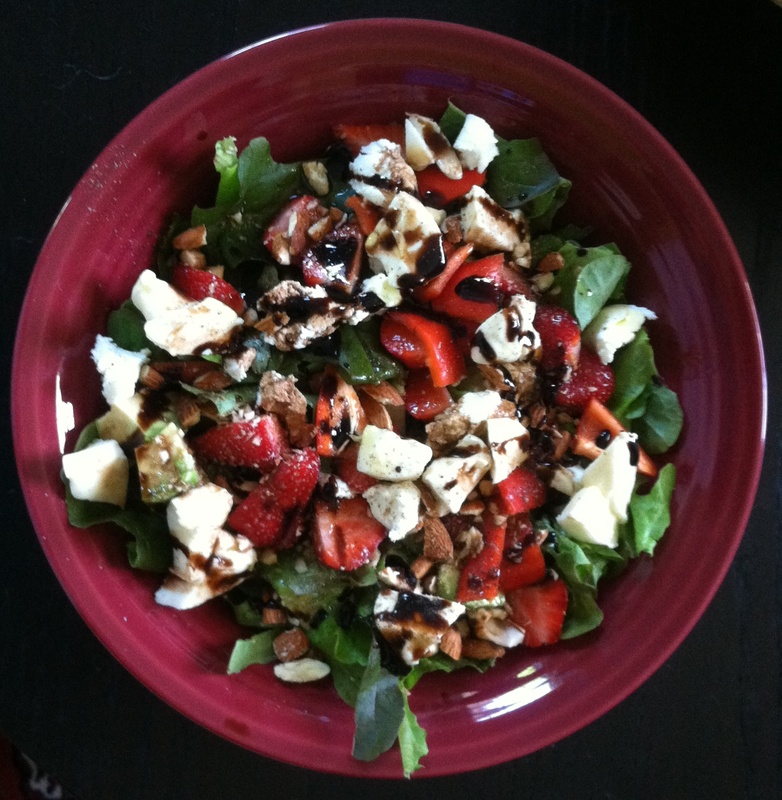 Mozzarella, goat cheese, strawberries, peppers, scallions, crushed almonds, and balsamic vinegar and oil on romaine. #5 Nuts and berries. Seriously, add cheese and salad fixings and the occasional restaurant foray to that and we’ve pretty much got my diet at the moment. My husband would have been pointedly bringing home packages of steak and chicken by now. (He might well have cooked them, too, mind you.) My son is often away for dinner or just not interested in what I make, so I’m pleasing myself with lots of salads, or just noshing on cheese and bread and fruit. Since much of the cheese is interesting stuff from Honest Weight Food Coop or the Troy Farmer’s Market, it’s been quite really nice. And easy. Now, I’m not saying I recommend any of this over the benefits of a loving romantic relationship — but when you don’t have that, for whatever reason, you might as well appreciate the unique pleasures of your situation.